The blue of Lake Garda, the green of the surrounding hills, the blue sky and the fresh breeze laden with Mediterranean scents: this is the Poiano Resort, an idyllic site. The perfect accommodation for couples or families, for conferences and meetings, group travel, wedding celebrations and other special occasions, or simply to spend a charming break in complete tranquillity in the modern Poiano La Spa. 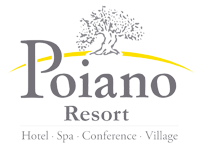 Surrounded by 60 hectares of Mediterranean greenery (palm trees, olive trees, vineyards, oleander bushes and cypress trees), in a garden of roses, violets, hydrangeas, geraniums, the Poiano Resort offers a wide range of leisure and well-being. The historic center and the lakeside of Garda are 2 kilometers far and are easily accessible on foot or with the convenient shuttle service made available free of charge from our hotel.